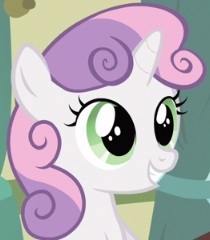 We need Pinkie Pie. If we're the ones onstage, who's gonna guide us? Hey, look, my sister's come to watch! I wasn't scared before, 'cause the show was so far away. But now it's here and I'm...afraid. I wasn't scared before, 'cause the show was so far away, but now it's here and I'm...afraid. (Singing) Hush now! Quiet now!/It's time to lay your sleepy head!/Said hush now! Quiet now!/It's time to go to bed!